This hunt is easy to add to any big game safari. Bring the better half to Cape Town and let her enjoy a day of shopping and culture with our private guide while you sneak away for a day in the field! 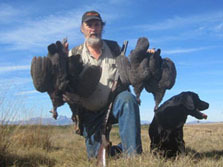 Our bird hunting in the Western Cape is one of the finest hunting destinations for bird hunters in the world. 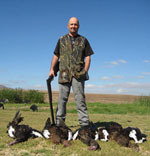 There is an opportunity to hunt various types of birds in a day's outing and offering you some great challenges. 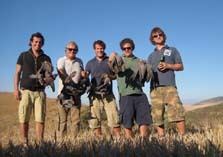 During our summer months we offer one of the most fantastic Rock Pigeon shooting, where you could be shooting pigeons at speeds of over 70 Km (43 MPH) an hour. This is a real challenge. 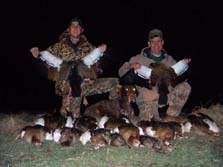 In our winter month's geese are also a great challenge around our ponds with hides and decoys. 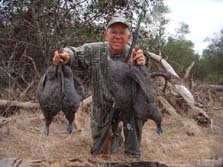 Our Guinea fowl hunting is one of the greatest birds to hunt and it is the most clever terrestrial birds to hunt and a lot more difficult to hunt than any other bird. 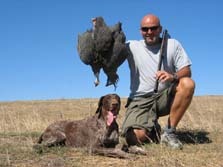 All our birds are seasonal; however we hunt through the year.